Golfers don't always have time for a full round of golf and beginners are seldom ready for regulation courses. Because of affordable National City golf deals at National City Golf Course, golfers wanting to avoid big courses have a choice. 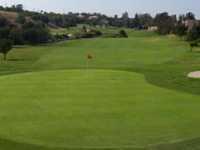 This course is a nine hole little jewel located in National City, Ca., 10 miles south of downtown San Diego. The National City Golf Course was designed by John Muir Graves and opened in 1970. This is a par 34 with one par 5, five par 4s and three par 3s. The course covers 2,197 with a course rating of 30.4 with a slope of 112 on Bermuda/Poa grass. The course plays fairly easy. Several par 4s are drivable. The par 5 is 505 yards which does allow you to let it out a notch. Overall, the course is very well maintained. If you are looking for National City tee times, the course does not typically reserve tee times. Instead, National City Golf Course tee times are provided on a walk-up basis. The course does run special promotions or discounts. Amenities include a nite-lit driving range and putting green, rental clubs, cart rental, a small pro shop, and snack bar.